A homemade lawn and garden fertilizer made with ammonia is safe for children, pets and the environment. Making a homemade fertilizer is also an economical alternative to purchasing commercial fertilizers. Ammonia, when used in combination with a few simple household ingredients, yields a vibrantly colored lawn and garden adequately nurtured through the roots from the enhanced soil. A combination of one nitrogen atom and three hydrogen atoms yields an ammonia molecule. With its pure form being an anhydrous gas, it easily mixes with water, but when exposed to air, it easily dissipates into the atmosphere. Ammonia sold for household use is actually an aqueous ammonia solution. The nitrogen richness of ammonia benefits plants. It is nearly harmless when used in moderation and in its diluted form. Ammonia added to the soil becomes a nutrient for the plant's roots and for soil bacteria, whose proliferation enriches the soil further with nutrients. This promotes healthy root growth and rich, green color. It is also an effective pesticide that controls slugs and undesired insects that damage the vegetation. Epsom salt is magnesium sulfate providing magnesium and sulfur to plants and enhances nitrogen, potassium and phosphorus that plants need from the soil. 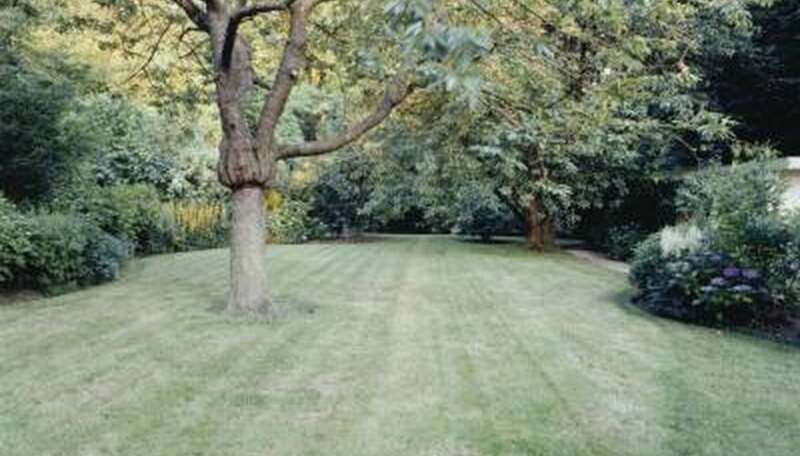 As a lawn feed, it combines with ammonia's nitrogen properties to fertilize the lawn. Apply it in the spring and fall when the weather is neither too hot nor too cold. A spring application stimulates root growth, while the fall application supports the roots' energy stores for winter dormancy. The surfactant properties of dish soap make it an effective soil softener enhancing the soil's water absorption and retention properties. Some soils, especially when dry, repel water. Dish soap applied to the soil acts as a wetting agent that helps bind the water to the soil. The longer the water binds to soil before running off, the softer and more aerated the soil becomes; an ideal condition for healthy root growth. As stated in the "Using Wetting Agents (Nonionic Surfactants) on Soil" article published by the North Carolina Cooperative Extension Service, J.V. Baird and J.P. Zublena point out that because of the wetting agent, the soil's water-retention qualities remain even after the soil dries. Once wet again, the soil still has its improved water-retention properties. The ammonia in the mix penetrates the loose and moist soil, replenishing the plants through the roots. This mixture is beneficial to houseplants, the lawn and outdoor vegetation. Dilute 1 tbsp. of household-grade ammonia in 1 gallon of water. Transfer this solution to a garden sprayer for treating the lawn and garden. Solutions of one part ammonia with added ingredients such as one part Epsom salt or one part dish soap are also diluted in water, but to 1 qt. Fill a garden sprayer container with the solution and broadcast it across the lawn and garden with the hose.